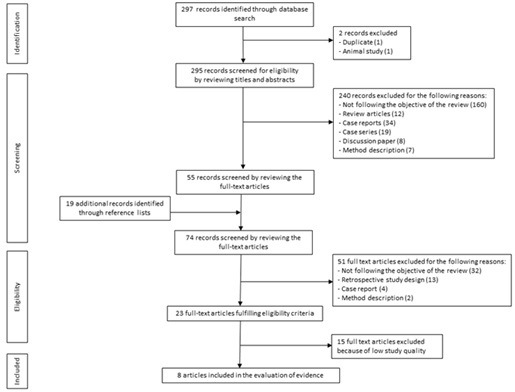 To undertake a systematic review of the evidence supporting early treatment (before the age of 10) of Class II malocclusion, with special reference to short and long-term outcomes: correction of overjet, dental relationships, improvement in intermaxillary relationships, soft tissue profile, associations to Temporomandibular Disorders (TMD), quality of life, incidence of trauma and cost-effectiveness. Four databases were searched, from January 1960 to October 2017. Inclusion criteria were randomized controlled or controlled trials reporting short or long-term effects on dental or basal relationships, soft tissue profile, associations to TMD, quality of life, incidence of trauma, or costs. The quality of evidence was scored according to GRADE. 297 studies were identified and 23 satisfied the inclusion criteria for full evaluation. The quality of evidence was high in 5 studies, moderate in 3, and low in 15. There is lack of data on long-term outcomes and stability, thus all evidence is based on short-term results. There is high level of evidence that early treatment of Class II malocclusion with functional appliances reduces overjet and improves skeletal relationships, moderate evidence that headgear reduces overjet and restrains forward growth of the maxilla, but insufficient evidence to determine how early treatment influences soft tissue profile, TMD, quality of life, incidence of trauma or treatment-related costs. There is moderate to high evidence that in the short term, early treatment of Class II malocclusion division 1 reduces overjet and improves skeletal relationships. Class II malocclusion is one of the more common malocclusions in children. The reported prevalence ranges from 14 to about 25% depending on the age of the children observed [1,2]. Various dental and basal deviations may result in a Class II malocclusion. Mandibular retrusion is common finding , as are pronounced overjet and prominent maxillary incisors with incomplete lip closure. Pronounced overjet and incomplete lip closure has been shown to increase the risk for dental trauma . Recent Cochrane review reported that early treatment with a functional appliance achieved a statistically significant reduction in the incidence of incisal trauma . This finding has however been further discussed due to a high degree of uncertainty . Also Temporomandibular Disorders (TMD) has claimed to be associated with Class II malocclusions  but the effect treatment of Class II malocclusions may have on development of TMD is insufficient . Early versus late orthodontic treatment has been debated. Proponents of early intervention have claimed that treatment is easy to perform, there is better use of growth potential, the extent of treatment in the permanent dentition is reduced and there should be less damage to teeth and tissues . Furthermore, early treatment of Class II malocclusion has also claimed to have positive influence on self-esteem . Comparison of one and two-phase treatment of Class II malocclusion showed no difference with respect to final overjet, basal relationship or the overall treatment success as scored by Peer-Assessment-Rating (PAR) . Additionally, systematic reviews have concluded that compared to one-phase treatment, two-phase treatment offers no advantage, except for the reduction in the incidence of incisor trauma. Most of the available research is based on study populations that start their treatment from the age of ten and up to early teens . Treatment recommendations, whether formulated as public policies or for the individual patient, should be based on the best available research evidence. A Randomized Controlled Trial (RCT) is often the preferred study design for evaluating treatment, because it reduces bias. By assessing the overall quality of the research and exposing potential knowledge gaps, a systematic review of research into a specific question is a valuable aid to the clinician . A broad approach is of interest to evaluate the full effects of a treatment. A focus on patient centred outcomes, such as quality of life and dental trauma should be put in relation to dental and basal effects as well as a socio-economic aspect. Therefore, the aim of the present study was to undertake a systematic review of the evidence supporting early treatment (before the age of 10) of Class II malocclusion, with special reference to short and long-term outcomes: correction of overjet, dental relationships, improvement in intermaxillary relationships, soft tissue profile, associations to TMD, quality of life, incidence of trauma and cost-effectiveness. The review was structured according to the Goodman guidelines , starting with definition of the research question, followed by formulation of a plan for the literature search, then the search itself and retrieval of publications. Finally, data were interpreted to assess the overall evidence. An appropriate search strategy was designed in consultation with a senior librarian, including choosing appropriate Medical Subject Headings (MeSH) terms, selecting relevant databases and assisting in the computerized search. The search covered the period from January 1960 to October 2017. The databases MEDLINE via PubMed, Web of Science, Cochrane and CINAHL were selected. Five different search syntaxes were used. The first and basic search strategy comprised Malocclusion, Angle Class II (MeSH term) and Orthodontic appliances (MeSH term) and Dentition, Mixed (MeSH term), supplemented by a second: Malocclusion, Angle Class II (MeSH term) and Orthodontic appliances (MeSH term) and Dentition, Mixed (MeSH term) and Costs and Cost Analysis (MeSH term), third: Tooth injuries (MeSH term) and/or Tooth fractures (MeSH term) and Malocclusion, Angle Class II (MeSH term) and Orthodontic appliances (MeSH term) and Dentition, Mixed (MeSH term) and fourth search: Malocclusion, Angle Class II (MeSH term) and Orthodontic appliances (MeSH term) and Dentition, Mixed (MeSH term) and Temporomandibular Joint Dysfunction Syndrome (MeSH).The final search syntax used was Quality of Life (MeSH term) and/or Self Concept (MeSH term) and/or Patient Satisfaction (MeSH term) and Malocclusion, Angle Class II (MeSH term) and Orthodontic appliances (MeSH term) and Dentition, Mixed (MeSH term). Using PICO-criteria (Table 1), the inclusion criteria were set to select RCTs or prospective controlled studies of treatment of Class II malocclusion in the early mixed dentition. To ensure an early approach, treatment start before the age of 10 years was required. No limitations were made concerning language. The retrieved titles and abstracts of potentially relevant articles were assessed independently by three reviewers (J.K, L.B, and L.P). An article was ordered in full-text version if at least one of the reviewers considered it to be of potential relevance, or if the title and abstract were ambiguous, or did not provide sufficient information. A data extraction protocol was prepared for assessing the quality of the articles. The protocol was calibrated by joint review of three articles, followed by minor revision to reach consensus. Reviewing was undertaken independently by the three reviewers. In cases of disagreement the article was reread and discussed until consensus was reached. The quality of each separate study was classified as high, moderate or low . The strength of the scientific evidence was assessed according to the GRADE system . To qualify as high or moderate quality, the study required sufficient material, relevant controls and attrition no greater than 30%. Quality could be downgraded if shortcomings were apparent in study design, if there was lack of adjustment for potential confounders (selected material or reporting only successful treatment results), inconsistency of results, historic controls or if other limitations were apparent. The reference lists from articles deemed eligible were hand searched for additional studies and any supplementary studies were evaluated by following the same procedure as described above. The search strategy identified 297 studies, of which 74 were fully assessed. The selection process is illustrated, according to the PRISMA statement , (Figure 1) in which the most prevalent reasons for exclusions are reported. Inter-reviewer consistency in evaluation and grading of the full-text articles was 95 per cent. Twenty-three studies satisfied the inclusion criteria and were analysed for study quality. Fifteen studies were graded as low quality [16-30], as presented in Table 2. Thus, eight studies were finally assessed: 5 were graded as high quality [9,31-34] and three as moderate [35-37] (Table 3). All eight studies were RCTs, four conducted in USA [31,34,35,37], three in United Kingdom [9,32-33] and one in Sweden . The three studies from United Kingdom [9,32-33] originated from one and the same study population. In these studies, twin-block appliance therapy was compared with untreated controls. The American studies [31,34,35,37] were based on two different study populations. Two of them compared bionator and headgear treatment with untreated control subjects [31,34]. The other two studies compared bionator or headgear/bite plane treatments to untreated controls [35,37]. In the Swedish study  headgear and activator appliances were compared with untreated controls. Early treatment with twin-block showed a reduction in overjet and a correction of molar relationship in comparison with untreated controls . Three studies [34,36-37] reported that early treatment with bionator, activator or headgear also reduced overjet. Skeletal improvement after early treatment with twin-block was on average 2 mm, the result of a similar degree of growth modification in the maxilla and mandible. Although statistically significant, the improvement was not regarded as clinically important . Tulloch et al.,  showed that treatment with bionator or headgear reduced the basal Class II malocclusion in comparison with untreated controls. The headgear primarily restrained the forward growth of the maxilla while the bionator enhanced the forward positioning of the mandible. It was pointed out, however, that within all three study groups there were large individual variations in growth. Keeling et al.,  concluded that an overall apical base correction was found in both bionator and headgear/bite plane treatment groups when compared to untreated controls. The effect was due to mandibular enhancement, not restricted maxillary growth. Jacobson  found that both headgear and activator treatment restrained the forward growth of the maxilla. No support for enhanced condylar growthor forward positioning of the mandible could be found. The perceptions of facial profiles were favoured by early treatment with Twin-block. When judged by other children and teaching staff, treatment enhanced the profile, mainly due to the reduction in overjet and reduced visibility of teeth . No studies evaluating early Class II treatment and effects regarding TMD was identified. Early treatment with twin-block improved self-concept and reduced negative social experiences, but the effects on social behaviour were unclear . A significant number of children had already experienced incisor trauma before treatment were initiated . Most of the acquired injuries, before and during treatment, were minor [31,35]. One study showed that early treatment with bionator might reduce the incidence of trauma , whereas one was unable to find such a correlation . Koroluk et al.,  evaluated the incidence of dental trauma and the related costs. The conclusions were that dental trauma, although less extensive, was a frequent finding within all three groups. Early treatment with bionator could have some influence on reducing the incidence of trauma and thereby related costs, a finding that Koroluk et al.,  assessed in the context of the expected higher cost of two-phase treatment. The level of evidence refers only to short-term changes, as there was a lack of long-term follow-up. Based on the results of two studies of high quality and two of moderate, there was a high level of evidence that early treatment of Class II malocclusion with functional appliances reduced overjet [32,34,36-37]. The basal relationships were also improved by treatment, mainly by enhancing the forward positioning of the mandible [32,34,37]. Based on the results of one study of high quality  and one of moderate quality  there was a moderate level of evidence that headgear reduces overjet and also reduces the severity of the skeletal Class II malocclusion by restraining the forward growth of the maxilla. Because too few studies or contradictory results, evidence was insufficient as to the effect of early treatment on the influence on soft tissue profile , quality of life , incidence of trauma [31,35] or whether early treatment is cost-effective . The main finding for this systematic review was a high level of evidence that early treatment of Class II malocclusion and specifically Class II division 1, using a functional appliance reduces overjet and improves antero-posterior basal relationships in the short-term. There is a moderate level of evidence, also in the short-term, that headgear reduces overjet and restrains forward growth of the maxilla. Evidence was insufficient with respect to the effect of early treatment of Class II malocclusion on soft tissue profile, quality of life, incidence of trauma or treatment related costs. Though insufficient evidence found in this review, current research points to Class II treatment not being a risk factor for TMD development , further well-designed studies may add knowledge to this question. Finally, no conclusions with respect to long-term outcome and stability of early treatment could be drawn. Under the GRADE system for scoring evidence, study quality is denoted as high or moderate. Because there were few studies of adequate quality covering the same outcome, no evidence base emerged with respect to the effects of early treatment of Class II malocclusion on soft tissue profile, quality of life related measures or cost-effectiveness. However, when few relevant high quality studies are identified, it is important to bear in mind that insufficient or limited evidence does not imply lack of effect. Although it must be noted that every single case must be planned individually, with special consideration on patient’s needs and desires which also implies that a large proportion of patients with Class II malocclusion might not benefit from two-phase treatment , it is still important to identify the variables which characterize children in whom an early treatment approach would be advantageous . Therefore, in order to evaluate existing results and to fill potential knowledge gaps in this field, there is still a need for further methodologically well-designed studies. It was notable that three [9,32,33] of the five high quality studies were based on the same study population and that the other two [31,34] also originated from one and the same population. This could be considered problematic because the weighted result is based on a rather small number of study populations. The difference in outcome measures for the high quality studies as well as differences in methodology made it difficult to compare treatment results. Therefore, only a general conclusion regarding antero-posterior basal relationships could be drawn. From the initial 297 articles generated by the literature search, only 23 studies satisfied the eligibility criteria and were included in the final evaluation. This is not uncommon in a systematic review, as the purpose of the search strategy is to identify all relevant studies related to the research question. Furthermore, in order to avoid subjectivity in the assessments, independent observers evaluated the quality of separate studies and the overall level of evidence. Consistency among the observers was high (95%); any conflicting assessments were resolved by discussion to reach consensus. Moreover, using Goodman’s model  fulfilled the criterion of repeatability and minimized the risk that chance or arbitrariness would affect the conclusions. With reference to methodology, one of the most common reasons for exclusion was retrospective study design. Furthermore, because the objective was to evaluate early treatment, the composition of the study population was of great importance. A frequent reason for exclusion was the wide age range of the children who constituted the study group. This made it impossible to ensure an early treatment approach. One aspect which should be addressed is the fact that chronological age and dental age do not necessarily correlate. However, studies reporting dental age were seldom identified and an age span of several years was a common finding. An inclusion criterion limiting chronological age was considered appropriate in order to meet the definition of early treatment. An important determinant of success with removable appliance therapy is patient compliance, yet this factor was inadequately addressed in basically all studies. At best, there were statements describing how the patients were instructed to use the different appliances. Reports as to if, or how, this was controlled were lacking. To fully assess treatment outcome, the results should be considered in relation to patient cooperation and compliance. Finally, the findings of this systematic review are in accordance with a recent meta-analysis of cephalometric assessment of the treatment results for removable functional appliance therapy in the mixed dentition . With a broader focus, the aim of this systematic review was to evaluate treatment effects on dental and basal relationships as well as cost-effectiveness, incidence of trauma and impact on quality of life. It has been concluded that a two-phase treatment approach offers no final advantage compared to one-phase when looking at dental and basal variables . Whether early treatment can be justified from a psychosocial, socioeconomic or trauma preventive aspect is not yet validated scientifically. Therefore, further research is needed. This study has been supported by the Swedish Dental Society and the TePe Eklund Foundation Scholarship for research at Faculty of Odontology, Malmö University, Sweden. Thilander B, Myrberg N (1973) The prevalence of malocclusion in Swedish schoolchildren. Scand J Dent Res 81: 12-21. Thiruvenkatachari B, Harrison J, Worthington H, O'Brien K (2013) Orthodontic treatment for prominent upper front teeth (Class II malocclusion) in children. Cochrane Database of Systematic Reviews 13. McNamara JA Jr (1981) Components of class II malocclusion in children 8-10 years of age. Angle Orthod 51: 177-202. Petti S (2015) Over two hundred million injuries to anterior teeth attributable to large overjet: a meta-analysis. Dent Traumatol 31: 1-8. Thiruvenkatachari B, Harrison J, Worthington H, O'Brien K (2015) Early orthodontic treatment for Class II malocclusion reduces the chance of incisal trauma: Results of a Cochrane systematic review. Am J Orthod Dentofacial Orthop 148: 47-59. Sonnesen L, Bakke M, Solow B (1998) Malocclusion traits and symptoms and signs of temporomandibular disorders in children with severe malocclusion. Eur J Orthod 20: 543-559. Jiménez-Silva A, Carnevali-Arellano R, Venegas-Aguilera M, Tobar-Reyes J, Palomino-Montenegro H (2017) Temporomandibular disorders in growing patients after treatment of class II and III malocclusion with orthopaedic appliances: a systematic review. Acta Odontol Scand 18: 1-12. Bishara SE, Justus R, Graber TM (1998) Proceedings of the workshop discussions on early treatment. Am J Orthod Dentofacial Orthop 113: 5-6. O'Brien K, Wright J, Conboy F, Chadwick S, Connolly I, et al. (2003) Effectiveness of early orthodontic treatment with the Twin-block appliance: a multicenter, randomized, controlled trial. Part 2: Psychosocial effects. Am J Orthod Dentofacial Orthop 124: 488-495. O'Brien K, Wright J, Conboy F, Appelbe P, Davies L, et al. (2009) Early treatment for Class II Division 1 malocclusion with the Twin-block appliance: a multi-center, randomized, controlled trial. Am J Orthod Dentofacial Orthop 135: 573-579. Centre for reviews and disseminations (2009) Systematic Reviews: CRD’s guidance for undertaking systematic reviews in health care. Centre for reviews and disseminations, York, UK. Goodman CS (2014) HTA 101. Introduction to health technology assessment. National Library of Medicine, Bethesda, USA. Guyatt GH, Oxman AD, Vist G, Kunz R, Brozek J, et al. (2011) GRADE guidelines: 4. Rating the quality of evidence--study limitations (risk of bias). J Clin Epidemiol 64: 407-415. Balshem H, Helfand M, Schünemann HJ, Oxman AD, Kunz R, et al. (2011) GRADE guidelines: 3. Rating the quality of evidence. J Clin Epidemiol 64: 401-406. Moher D, Liberati A, Tetzlaff J, Altman DG; PRISMA Group (2010) Preferred reporting items for systematic reviews and meta-analyses: the PRISMA statement. Int J Surg 8: 336-341. Dann C, Phillips C, Broder HL, Tulloch JF (1995) Self-concept, Class II malocclusion, and early treatment. Angle Orthod 65: 411-416. De Almeida MR, Henriques JF, Ursi W (2002) Comparative study of the Fränkel (FR-2) and bionator appliances in the treatment of Class II malocclusion. Am J Orthod Dentofacial Orthop 121: 458-466. De Almeida MR, Henriques JF, de Almeida RR, Weber U, McNamara JA Jr (2005) Short-term treatment effects produced by the Herbst appliance in the mixed dentition. Angle Orthod 75: 540-547. De Almeida MR, Flores-Mir C, Brandão AG, de Almeida RR, de Almeida-Pedrin RR (2008) Soft tissue changes produced by a banded-type Herbst appliance in late mixed dentition patients. World J Orthod 9: 121-131. Harvold EP, Vargervik K (1971) Morphogenetic response to activator treatment. Am J Orthod 60: 478-490. Janson GR, Toruño JL, Martins DR, Henriques JF, de Freitas MR (2003) Class II treatment effects of the Fränkel appliance. Eur J Orthod 25: 301-309. Landázuri DR, Raveli DB, dos Santos-Pinto A, Dib LP, Maia S (2013) Changes on facial profile in the mixed dentition, from natural growth and induced by Balters' bionator appliance. Dent Press J Orthod 18: 108-115. Mills CM, McCulloch KJ (1998) Treatment effects of the twin block appliance: a cephalometric study. Am J Orthod Dentofacial Orthop 114: 15-24. Mills CM, McCulloch KJ (2000) Post treatment changes after successful correction of Class II malocclusions with the twin block appliance. Am J Orthod Dentofacial Orthop 118: 24-33. Quintão C, Helena I, Brunharo VP, Menezes RC, Almeida MA (2006) Soft tissue facial profile changes following functional appliance therapy. Eur J Orthod 28: 35-41. Silvestrini-Biavati A, Alberti G, SilvestriniBiavati F, Signori A, Castaldo A, et al. (2012) Early functional treatment in Class II division 1 subjects with mandibular retrognathia using Fränkel II appliance. A prospective controlled study. Eur J Paediat Dent 13: 301-306. Stamenkovic Z, Raickovic V, Ristic V (2015) Changes in soft tissue profile using functional appliances in the treatment of skeletal class II malocclusion. Srp Arh Celok Lek 143: 12-15. Wieslander L (1984) Intensive treatment of severe Class II malocclusions with a headgear-Herbst appliance in the early mixed dentition. Am J Orthod 86: 1-13. Wieslander L (1984) Intensive treatment in severe distal bite using the headgear-Herbst appliance in mixed dentition. Schweiz MonatsschrZahnmed 94: 1189-1206. Wieslander L (1993) Long-term effect of treatment with the headgear-Herbst appliance in the early mixed dentition. Stability or relapse? Am J Orthod Dentofacial Orthop 104: 319-329. Koroluk LD, Tulloch JF, Phillips C (2003) Incisor trauma and early treatment for Class II Division 1 malocclusion. Am J Orthod Dentofacial Orthop 123: 117-125. O'Brien K, Wright J, Conboy F, Sanjie Y, Mandall N, Chadwick S, et al. (2003) Effectiveness of early orthodontic treatment with the Twin-block appliance: a multicenter, randomized, controlled trial. Part 1: Dental and skeletal effects. Am J Orthod Dentofacial Orthop 124: 234-243. O'Brien K, Macfarlane T, Wright J, Conboy F, Appelbe P, Birnie D, et al. (2009) Early treatment for Class II malocclusion and perceived improvements in facial profile. Am J Orthod Dentofacial Orthop 135: 580-585. Tulloch JF, Phillips C, Koch G, Proffit WR (1997) The effect of early intervention on skeletal pattern in Class II malocclusion: a randomized clinical trial. Am J Orthod Dentofacial Orthop 111: 391-400. Chen DR, McGorray SP, Dolce C, Wheeler TT (2011) Effect of early Class II treatment on the incidence of incisor trauma. Am J Orthod Dentofacial Orthop 140: 155-160. Jakobsson SO (1967) Cephalometric evaluation of treatment effect on Class II, Division I malocclusions. Am J Orthod 53: 446-457. Keeling SD, Wheeler TT, King GJ, Garvan CW, Cohen DA, Cabassa S, et al. (1998) Anteroposterior skeletal and dental changes after early Class II treatment with bionators and headgear. Am J Orthod Dentofacial Orthop 113: 40-50. Proffit WR (2006) The timing of early treatment: An overview. Am J Orthod Dentofacial Orthop 129: 47-49. Koretsi V, Zymperdikas VF, Papageorgiou SN, Papadopoulos MA (2015)Treatment effects of removable functional appliances in patients with Class II malocclusion: a systematic review and meta-analysis. Eur JOrthod 37: 418-434. Figure 1: Flow of information through the different phases of the systematic review. Children starting orthodontic treatment for Class II malocclusion before the age of 10 years. Any intervention provided to treat Class II malocclusion in the early mixed dentition.Two-phase orthodontic treatments for Class II malocclusion when short-term outcomes are specifically reported after completing first phase of treatment.Controls are comparable non-treated children or children receiving another intervention. Short and long-term effects measured as: success in correction of overjet, dental relationship, improvement in intermaxillary relationship, soft tissue profile, incidence of trauma, quality of life and cost-effectiveness. Table 1: PICO Inclusion critera. Table 2: Studies classified as low level of quality. Downgraded to low quality because at least one of the following shortcomings was apparent: successful treatments only reported, historical controls, unclear inclusion criteria, insufficient material or unclear methodological approach. * Patient material in de Almeida et al.,  and de Almeida et al.,  is the same. ** Patient material in Mills and McCulloch  and Mills and McCulloch  is the same. *** Patient material in Wieslander  and Wieslander  is the same. A significant number of children (25%) had already experienced incisor trauma before treatment were initiated. No correlation was found between initial overjet and the prevalence of trauma. Early orthodontic treatment did not significantly affect the incidence of trauma. Most injuries before and after treatment were minor, consisting of enamel fractures. After twin-block treatment, the profile was rated as more attractive when compared to untreated controls. Visible front teeth and large overjet had negative impact on profile perception. At onset and at 15 months follow-up, both groups reported medium- to high self-esteem. Twin-block treatment resulted in an increased self-concept and a reduction in negative social experience. Twin-block treatment resulted in a reduction of overjet, 70% of the correction due to dentoalveolar changes. Skeletal improvement after early treatment with Twin-block was on average 2mm, the result of a similar degree of growth modification in the maxilla and the mandible. PAR-score was reduced by 42% in the treated group whereas in the controls PAR-score was increased by 9%. Trauma to maxillary incisors was found in all groups. Most injuries were minor and related costs were estimated as low. Treatment with Bionator might reduce the incidence of trauma, but should be initiated soon after eruption of maxillary incisors in order to be effective. It was estimated that the expected cost of trauma per child was less for patients who had early growth modification treatment than for patients whose treatment was delayed until their permanent dentition. However, early 2-phase orthodontic treatment is usually more expensive than a single-phase treatment approach. Bionator and headgear groups showed significantly more skeletal Class II correction than untreated controls. Early treatment with headgear resulted in significant dental Class II correction, affecting maxillary incisors and molars. Treatment with bionator or headgear/biteplane showed no effect on maxillary growth but both appliances enhanced mandibular anterior growth. Skeletal changes were stable after one year. Overall, early treatment showed a reduction in overjet and a 75% chance for improving the jaw relationship. Basal improvement was achieved through different mechanisms. Headgear resulted in maxillary restraint and Bionator in forward positioning and increased length of the mandible. Great individual response to treatment and difference in growth were registered in both the treatment and control groups. Early treatment reduced overjet. Activator and Headgear treatment appeared to affect positioning of the maxilla, most pronounced by Headgear treatment. Both treatments significantly increased facial height. Activator treatment had an effect within the dento-alveolar area of the mandible, but no support for an orthopaedic effect was found. Table 3: Studies included in the evaluation of evidence. Citation: Kallunki J, Bondemark L, Paulsson L (2018) Outcomes of Early Class II Malocclusion Treatment - A Systematic Review. J Dent Oral Health Cosmesis 3: 009.